Professor Petra Aczel, Head of the Institute of Behavioural Sciences and Communication Theory at Corvinus University, and Maurizio Pirro, Associate Professor of German Literature of the University of Bari Aldo Moro will receive the sixth annual CEU European Award for Excellence in Teaching in the Social Sciences and Humanities. The award, initiated by CEU Provost and Pro-Rector Liviu Matei and overseen by the University’s Center for Teaching and Learning (CTL), aims to promote excellence in teaching across the European Higher Education Area. Aczel and Pirro each received the Award, and each received the accompanying €5,000 Diener Prize, at CEU's Opening Ceremony for the 2017-18 academic year on September 15. A leader in the field of rhetorical theory and the author of six books and more than 100 articles, Aczel teaches courses such as New Media in Global Contexts, Theories of Communication, Organizational Communication, and other aspects of new media rhetoric and communication. Her many distinctions and awards include the 2015 Kenneth Rice Prize for Teaching Excellence and 2012 Teacher of the Year, both at her home institution, Corvinus University in Budapest. Professor Pirro teaches courses on German Literature, including advanced courses on German theater, literature and cinema, from the classical to the contemporary period. He has received numerous honors and grants in recognition of his research. Members of the selection committee were impressed by Aczel's extraordinary commitment and dedication to student learning and her excellence and leadership as both a teacher and scholar. They took particular note of her innovations in teaching rhetorical theory and practice and new media rhetoric and communication. Committee members also recognized her work as a model of research-driven teaching – both in terms of pedagogy and in terms of integrating up-to-date scholarship in all of her teaching. Her dedication to student learning was evident in all of the letters of support the committee received. Pirro has introduced major elements of the German seminar model into his teaching of both undergraduate and graduate courses, focusing on student learning and critical inquiry. He proposed distributing during undergraduate students' three years the texts ascribed to German literary canon, devoting each year of the degree respectively to the 18th, 19th and 20th century. That, a distinguished former colleague of Pirro’s wrote, would grant students the necessary foundations for the monographic courses offered during their master’s studies. 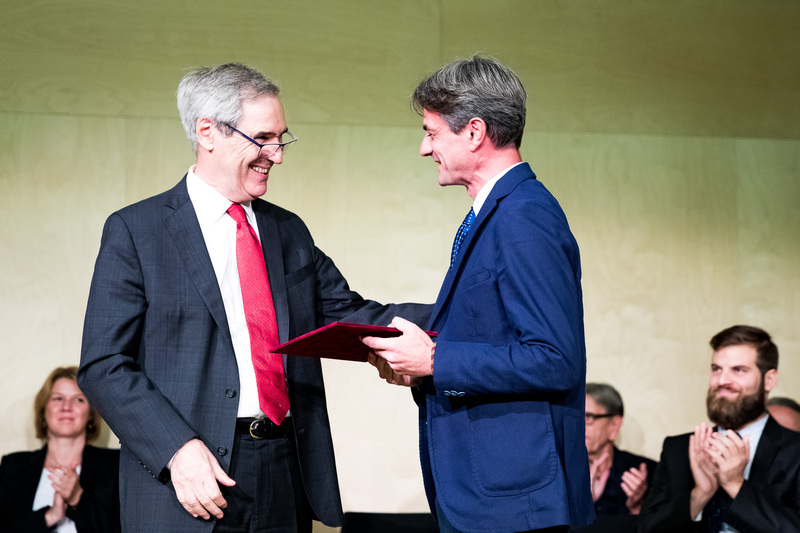 President and Rector Michael Ignatieff and Professor Maurizio Pirro of University of Bari. Photo: CEU/Kepszerkesztoseg, Zoltan Adrian. The selection committee was impressed by Pirro’s sustained attention to individual students’ learning, both inside and outside the classroom; and his introduction of student-centered learning approaches in the teaching. His students submitted a “visual portfolio” to explain the profound impact his teaching has had on their knowledge, intellectual understanding, and their independence as thinkers. In addition to his deep commitment to teaching and learning, the selection committee was gratified to be able to confer the award on an academic whose dedication to excellence in teaching is as impressive as his recognized excellence as a research scholar – a rare combination. Aczel earned her MA in Hungarian linguistics and literature and her PhD in rhetoric, both at Budapest's Eotvos Lorand University. Professor Pirro earned an MA in literature from the University of Bari Aldo Moro and his PhD in German language and literature from the University of Pavia. The Diener Prize is made possible by a generous gift from Steven and Linda Diener in memory of Ilona Diener. For further information on the award and past winners, visit: http://ctl.ceu.edu/teaching-award. CEU begins its 27th academic year by welcoming more than 700 new students from more than 90 countries. Together, CEU is home to nearly 1,500 students from 116 countries. The CEU community also includes around 14,000 alumni worldwide.